Lon Chaney is one of the most fascinating movie stars in film history. Throughout the 1920s, Chaney was one the biggest box office draws the world over despite what could kindly be described as an unhandsome face – one that was often disguised by heavy layers of make-up to make him look ancient, deformed, Chinese, female, etc. His roles usually fell into two categories: total fiends, or fiends and semi-fiends in love/lust with or protective of some pretty young thing or other. Which Lon Chaney movies would I recommend? All of them, even though many of his vehicles aren't exactly what I'd call “good movies.” Roland West's The Monster (1925), for instance, is quite silly – but since Lon Chaney is in it, how could it not be recommendable? In The Unholy Three, Chaney plays the grandmotherly owner of a bird shop, which happens to be the business headquarters of a trio of crooks led by an unscrupulous criminal – who, huh, just happens to be the pet shop's granny herself. Some prefer Jack Conway's 1925 silent version to the 1930 talkie directed by Tod Browning; for my part, I prefer the latter. Chaney's only talking picture, the 1930 The Unholy Three moves faster, offers better characterizations thanks to the use of dialogue, features a more accomplished supporting cast (including leading lady Lila Lee instead of the original's Mae Busch), and is proof that Lon Chaney would have remained a major star during the sound era. Chaney died of cancer the same year The Unholy Three was released; thus, the title role in Browning's Dracula went to Bela Lugosi. Now, He Who Gets Slapped (1924) and The Unknown (1927) are my two favorite Chaney vehicles. Both are set in a circus and both are MGM releases. The similarities end there. Directed by Swedish import Victor Sjöström, He Who Gets Slapped stars Chaney in the title role – HE, a clown who gets slapped around and one with a dark past to boot. Norma Shearer is the young woman he cares for, but dashing John Gilbert is the man she cares for. I find He Who Gets Slapped is one of the greatest silent films I've seen: it's poetic, beautifully acted (Chaney, Shearer, and Gilbert are at their most subtle), and gloriously shot in dreamy black and white (Milton Moore). It was also the first movie made under the banner of the newly formed Metro-Goldwyn studio, shortly thereafter renamed Metro-Goldwyn-Mayer. Directed by Tod Browning, The Unknown is an exercise in perversity. Chaney plays an armless dagger thrower who falls madly in love with youthful Joan Crawford. Fickle Crawford initially tells Chaney she hates men's arms, but then changes her mind after falling in love with strongman Norman Kerry. That leads to a series of tragedies and one of the most bizarre movie climaxes on record. Chaney overacts in The Unknown, but performance feels appropriate for both the over-the-top plot and the character himself. Crawford, for her part, looks refreshingly unselfconscious, while Kerry is perfect as the beefy object of her affection. Get ready for more extreme perversity in West of Zanzibar (1928), as Chaney abuses both Warner Baxter and Mary Nolan, while the great-looking Mr. Wu (1927) offers Chaney as a Chinese creep about to destroy the life of lovely Renée Adorée – one of the best and prettiest actresses of the 1920s. Adorée – who was just as effective in her few early talkies – died of tuberculosis in 1933. Also worth mentioning, the great John Arnold was Mr. Wu's cinematographer. I'm no fan of Laugh, Clown, Laugh (1928), The Hunchback of Notre Dame (1923), or The Phantom of the Opera (1925), but Chaney's work in them – especially in Hunchback – is quite remarkable. I mean, his performances aren't necessarily great, but they're certainly unforgettable. Chaney's leading ladies – all of whom are in love with younger, better-looking men – are Loretta Young (Laugh, Clown, Laugh), Patsy Ruth Miller (as The Hunchback of Notre Dame's Esmeralda), and Mary Philbin (The Phantom of the Opera). 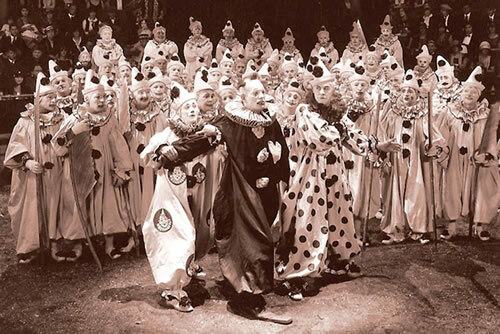 Norman Kerry is Chaney's rival in both Hunchback and Phantom; Nils Asther plays the other man in Clown. A bit of trivia: Lon Chaney was one of MGM's official five stars in 1925. The other four were Lillian Gish, Ramon Novarro, Norma Shearer, and John Gilbert. In August 1926, Chaney, Novarro, and Gilbert were each making $3,000 a week (approximately $37,000 today); Norma Shearer was making $2,000. Lillian Gish, under a special per-picture contract, was making $7,692.20. 6:00 AM THE ACE OF HEARTS (1921) In this silent film, a revolutionary is ordered to kill his romantic rival. Dir. : Wallace Worsley. Cast: Leatrice Joy, John Bowers, Lon Chaney. Black and white. 75 min. 7:30 AM THE UNHOLY THREE (1930) A ventriloquist, a strong man and a midget form a criminal alliance. Dir. : Jack Conway. Cast: Lon Chaney, Lila Lee, Elliott Nugent. Black and white. 72 min. 9:00 AM OLIVER TWIST (1922) A young orphan falls in with a man training children to be thieves. Dir. : Frank Lloyd. Cast: Jackie Coogan, Lon Chaney, Gladys Brockwell. Black and white. 74 min. 11:00 AM HE WHO GETS SLAPPED (1924) In this silent film, a scientist flees his tragic past to become a circus clown. Dir. : Victor Seastrom. Cast: Lon Chaney, Norma Shearer, John Gilbert. Black and white. 72 min. 12:15 PM THE MONSTER (1925) In this silent film, a mad scientist engineers car wrecks so he can experiment on the survivors. Dir. : Roland West. Cast: Lon Chaney, Gertrude Olmsted, Hallam Cooley. Black and white. 87 min. 1:45 PM TELL IT TO THE MARINES (1926) In this silent film, a tough drill sergeant and a spoiled recruit become romantic rivals. Dir. : George Hill. Cast: Lon Chaney, William Haines, Eleanor Boardman. Black and white. 103 min. 3:30 PM MOCKERY (1927) A peasant saves a countess during the Russian Revolution. Dir. : Benjamin Christensen. Cast: Lon Chaney, Ricardo Cortez, Barbara Bedford. Black and white. 70 min. 4:45 PM MR. WU (1927) In this silent film, a Chinese patriarch goes mad when his daughter falls for an Englishman. Dir. : William Nigh. Cast: Lon Chaney, Louise Dresser, Renée Adorée. Black and white. 91 min. 6:30 PM LAUGH, CLOWN, LAUGH (1928) In this silent film, a circus clown falls for a young innocent in love with another. Dir. : Herbert Brenon. Cast: Lon Chaney, Bernard Siegel, Loretta Young. Black and white. 74 min. 8:00 PM THE HUNCHBACK OF NOTRE DAME (1923) In this silent film, a deformed bell-ringer gives sanctuary to a beautiful gypsy accused of witchcraft. Dir. : Wallace Worsley. Cast: Lon Chaney, Ernest Torrence, Patsy Ruth Miller. Black and white. 117 min. 10:00 PM THE PHANTOM OF THE OPERA (1925) In this silent film, a hideously deformed man haunts the sewers beneath the Paris Opera. Dir. : Rupert Julian. Cast: Lon Chaney, Mary Philbin, Norman Kerry. Black and white. 90 min. 12:00 AM THE UNHOLY THREE (1925) In this silent film, a ventriloquist masquerades as an old lady to front a crime ring. Dir. : Tod Browning. Cast: Lon Chaney, Mae Busch, Matt Moore. Black and white. 86 min. 1:30 AM THE UNKNOWN (1927) In this silent film, an escaped killer pretends to be a sideshow's armless wonder. Dir. : Tod Browning. Cast: Lon Chaney, Norman Kerry, Joan Crawford. Black and white. 50 min. 2:30 AM WEST OF ZANZIBAR (1928) In this silent film, a mad African dictator plots revenge on the trader who stole his wife. Dir. : Tod Browning. Cast: Lon Chaney, Lionel Barrymore, Mary Nolan. Black and white. 65 min. 3:45 AM WHERE EAST IS EAST (1929) An animal trapper in Indochina fights to keep his former mistress from destroying their daughter's life. Dir. : Tod Browning. Cast: Lon Chaney, Lupe Velez, Estelle Taylor. Black and white. 67 min. 5:00 AM LONDON AFTER MIDNIGHT (1927) In this silent film, vampires are suspected in an unsolved murder. Dir. : Tod Browning. Cast: Lon Chaney, Marceline Day, Henry B. Walthall. Black and white. 47 min. This was film in it's original state; crazy , wonderful and experimental. And the people flocked to the cinema to see the “artists” deeply portraying their characters.